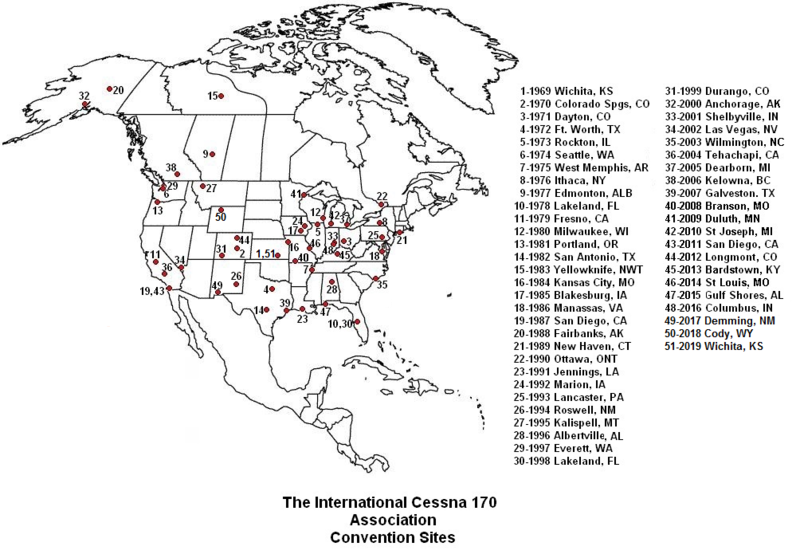 The International Cessna 170 Association (TIC170A) was formed in 1969. At last count (June, 2016) we had 1094 members that own a total of 929 Cessna 170s. Our members organize many fly-ins around the country. An annual convention is held in different locations each year and it attracts 170s from far and wide. The 51st annual convention, commemorating the 50th birthday of TIC170A, will be in Newton, KS on June 6-12, 2019. The host airport will be Newton City County (KEWK). Click here for details (including hotels). Other info will appear there as it becomes available. We now have many more choices for apparel and accessories - woven shirts, polos, knits, t-shirts, active wear, hats, accessories, fleece, and more. All come with our logo embroidered on (tees are screen printed). N-numbers and other personalization can be added! We are very excited about these new choices and you will be too! The 170 NEWS (1st quarter 2019) is in the Members Only section. (click the images to enlarge). ELECTRONIC FLYPAPER AVAILABLE! - We are offering members the option of receiving the Flypaper each month electronically instead of a paper copy by mail, or both. This option began with the October 2003 issue. The Flypaper will be e-mailed as an attachment in PDF format. This is a great way to help the club reduce printing and mailing expenses! For further details and instructions, log into the Members Only section. The Feb., 2019 e-FlyPaper is now available in the "Members Only" section. You can send money electronically (and securely) to TIC170A using your free PayPal account. Just click the appropriate button to the left. It's not necessary to join PayPal to use the service. Most credit cards are accepted by PayPal. You can check out the PayPal system at http://www.paypal.com. We accept MasterCard, VISA and Discover for memberships and merchandise! But, this is not yet a secure site. To make a credit card transaction, you can use PayPal (see above) or you need to mail (not email), phone or fax the card number, expiration date and the owners name to the headquarters. Note that PayPal IS a secure site and can be used for Discover card, American Express, Visa and Mastercard purchases. The International Cessna 170 Association, Inc.
For disclosure on association information, check out public records available on www.guidestar.org. Copyright 2014 - The International Cessna 170 Association, Inc.